Colic is fairly common, affecting anywhere from 10 percent to 40 percent of infants. It doesn’t happen more in any one group over another, so it shows up in boys and girls of all cultures and races. It also occurs in both breastfed babies and formula-fed babies. While there isn’t a clear-cut reason for colic, there are some breastfeeding-related issues that could contribute to the symptoms. Here’s what you need to know about breastfeeding a baby with colic, and how to get through those first few months. Colic may be frustrating and sometimes scary, but it’s not believed to be dangerous or to have any long-term consequences for the baby. Often, babies who have colic will eat, gain weight, and grow normally. Colic comes on suddenly and lasts for long periods of time. It can happen anytime, but it’s often worse in the evening or at night. It typically begins when a baby is two to three weeks old and subsides by four months of age. However, babies can continue to have colic beyond four months. An overactive let-down: When your milk flows out of your breast into your baby’s mouth very quickly and forcefully, your child may have to gulp it down. When a baby is gulping down milk, he’s also swallowing a lot of air. Air trapped in the stomach and intestines can cause gas and stomach pain. An overabundant breast milk supply: If you have an oversupply of milk, your baby may be getting too much foremilk. Foremilk is the thinner milk that flows from the breast at the beginning of the feeding. It contains more lactose or milk sugar. Usually, as a baby breastfeeds, the foremilk gradually turns to a creamier, more filling milk called hindmilk. But, when there’s an oversupply, the baby may fill up on foremilk before getting enough hindmilk. This situation is called a foremilk-hindmilk imbalance. Too much foremilk can cause gas, loose green bowel movements, and symptoms of colic. Mom’s diet: The foods that you eat make their way to your baby through your breast milk. Some babies can have a reaction or an allergy to certain substances. Cow’s milk and dairy products are the most common offenders, and they can cause digestive problems leading to colic or colic-like symptoms. Other possible causes of colic that are not related to breastfeeding include GERD, an immature digestive system, fatigue, hypersensitivity to lights and sounds, and having a mom who smokes. If your baby has colic, you do not need to stop breastfeeding. Breastfeeding is not a cause of colic, and babies who take infant formula get colic, too. Switching to formula may not help. It may even make the situation worse. If you’re breastfeeding and you believe your baby is suffering from colic because of one of the breastfeeding-related issues listed above, there are a few things you can do try to help your baby and make things better. Since the exact cause of colic is a mystery, there isn’t a specific treatment. That doesn’t mean there isn’t anything you can do. Here are some of the ways you can try to reduce colic in your breastfed baby. Breastfeed more. If your baby is crying, you can offer the breast even if you don’t think she’s hungry. Breastfeeding is comforting for your child. It brings your child close to your body where she feels warm and secure. Skin-to-skin contact during breastfeeding may also be soothing. Burp your baby. Breastfed babies tend to take in less air during feedings than bottle-fed babies, so they don't always need to burp after feedings. But, if you have a forceful let-down or an overabundant milk supply, your child may be taking in extra air. Crying is another way baby’s get air in their stomachs, and colicky babies do cry. Since colic is associated with gas, burping is an easy way to try to get some of that uncomfortable air out of your baby’s belly. Slow a hyperactive let-down. Before you breastfeed, you can pump or use a hand expression technique to remove a little bit of breast milk, relieve the pressure in your breast, and release that first, forceful let-down. Then, when the flow of your milk slows down, you can begin to feed your baby. You can also use gravity to help slow the flow of your breast milk by breastfeeding in a reclined position, such as while lying on your back or leaning back in a chair. Deal with an oversupply of breast milk. Breastfeeding from only one breast at each feeding can help your baby get both foremilk and hindmilk. If you have a superabundant milk supply and switch breasts during a feeding, your baby is more likely to get foremilk from both sides. But, by staying on one breast the entire time you're breastfeeding, your child is more likely to reach the hindmilk as he fully drains that breast. Review your diet. You can try to remove dairy products from your diet to see if the colic improves. Other possible foods that your baby may react to are nuts, soy, eggs, caffeine, and shellfish. Be patient if you eliminate items from your diet. It can take over a week to see results. Consider Probiotics. Ask your doctor about probiotics. Research on the probiotic Lactobacillus reuteri shows that it may help reduce colic in breastfed infants. Swaddle: Swaddling a baby in a blanket helps the baby feel secure. Swaddled babies startle less and tend to sleep better. Just remember to place your baby on his back to sleep to reduce the risk of SIDS. Offer a pacifier: Sucking is calming for infants. If you have a healthy milk supply and your baby is over four weeks old and breastfeeding well, you can try a pacifier. Use gentle movements: Try some gently rocking, an infant swing, or a walk in the stroller. A ride in the car can give you both a change of scenery. The hum of the engine and the motion of the drive can do wonders to soothe a baby. Reduce stimulation: Make the baby’s environment calm. Turn down the lights and lower the TV or turn it off. It doesn’t have to be completely dark and quiet, but less stimulation may be effective. Add some background noise: Some babies find consistent low sounds comforting. You can run the vacuum or try a white noise machine. Research indicates that music may be helpful. Wear your baby: Your baby may cry less if you hold her close to your body. However, if you hold your baby all day, you may not be able to get anything else done. For the best of both worlds, use an infant carrier or a sling to hold your baby close and keep your hands free. Take a nap: Taking care of a colicky baby requires extra energy, and since it often shows up at night, you may be losing sleep. Get rest when you can, especially during the day when the baby is napping. Whenever possible, take a break. Ask your partner, your mom, a friend, or a caregiver to help and watch the baby for a while. Sometimes you just need a little time away to clear your head and go back to your child refreshed. A walk in the fresh air or even a trip to the grocery store may be all you need. If your child cries for an extended period, you should notify the doctor. The doctor will check to be sure your child doesn’t have any other symptoms or medical issues such as an ear infection or an illness. If it’s not colic, your baby may feel much better after the proper treatment. However, if your child is healthy and the doctor cannot find a reason for the crying, it is most likely colic. Fussy and colicky babies need to be held and comforted more than calmer infants. Responding quickly to your baby’s cry and picking your child up and holding her often or even continuously will not spoil your child or encourage her to cry more for attention. Instead, by reacting to your child right away, you’ll make her feel secure and safe, and you’ll show her that she can trust you to be there when she needs you. Babies with colic can cry nonstop. It can be emotionally and physically draining on you as you hold, rock, walk and try to comfort your child for hours without any results. You may even find yourself crying right along with your baby. If it gets to be too much and you feel like you can’t take it anymore, then you need a break. Ask your partner or someone you trust to watch the baby and take some time for yourself. If you’re alone, place the baby down gently in his crib or another safe place and walk away to call someone for help. It’s OK to let the baby cry and go back to check on her every so often until someone comes to help or you feel like you can handle it again. Just keep in mind that no matter how stressed you get, you should never shake your baby. Shaking a baby can lead to brain damage or death. Babies cry. It’s how they communicate. Your baby will cry to let you know when she’s hungry, tired, in need of a diaper change, in need of your company, or in pain. But, when your baby cries uncontrollably, and nothing you do can console her, it can be frustrating and heartbreaking. You may feel bad for your child or guilty and helpless that there’s nothing you can do to help her. After hours of trying you may even be feeling the stress and begin having more difficulty coping. All of these feelings are normal. 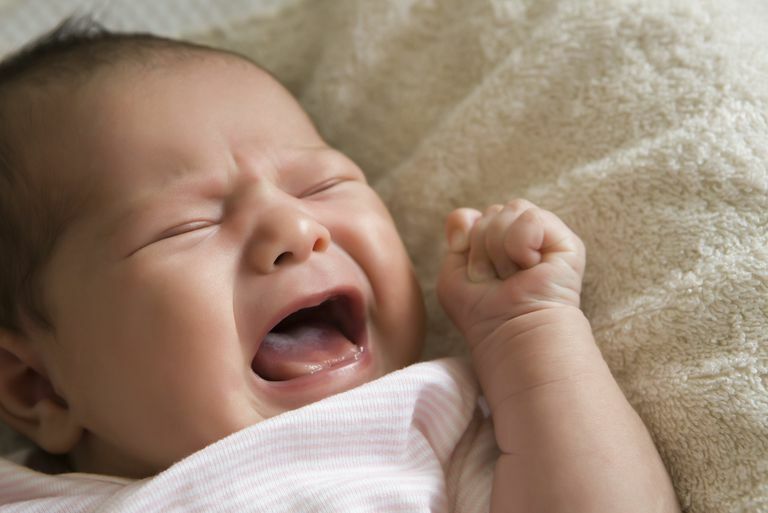 Colic isn’t your fault, and you’re not a bad parent. In fact, many other parents are in the same boat. You can only do what you can to try to soothe your child, so she knows you are there for her. And, remind yourself to stop and take a break when you need it. It may seem like it’s never going to get better. And, when you're in the thick of it, a few weeks can feel like years. But, thankfully, colic does go away, sometimes as suddenly as it arrived. You’ll get there. It just takes a little time and patience. Douglas P, Hill P. Managing infants who cry excessively in the first few months of life. BMJ. 2011 Dec 15; 343:d7772. Johnson JD, Cocker K, Chang E. Infantile Colic: Recognition and Treatment. American family physician. 2015 Oct 1; 92(7). Lucassen P. Colic in infants. BMJ clinical evidence. 2010.